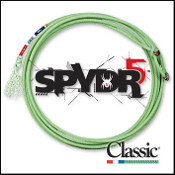 Classic Rope's legacy of team rope innovations continues with the five strand Spydr team rope. The Spydr is the latest addition in Coretech™ technology from Classic Rope. So slim it appears light, but don't be deceived. The Spydr's five strand weave packs more material in a smaller diameter for a feel like nothing else. With five strands of twisted nylon ingeniously engineered around an oversized core, the Spydr delivers the perfect balance of snap and tip weight to make it the ultimate trap for your prey.